The inside of a beehive would be challenging to navigate for humans who rely on light to see around us. Even filming inside a beehive requires an infrared camera to capture images. While bees’ vision works differently than ours, they primarily rely on other sensory organs to navigate inside the hive. Unlike humans, bees actually have five eyes. Bees have two large compound eyes made up of thousands of ommatidia, which act like separate sensory devices. Each of these ommatidia has its own lens, cones and other cells that gather information about the bee’s environment and send it to the brain for processing. As a result, bees view the world as a mosaic and not as a single image the way humans do. Additionally, bees have three simple eyes known as ocelli, which allow them to more easily recognize the contrast between light and dark. Bees’ ommatidia contain three types of photoreceptors. These photoreceptors can recognize blue-green and blue-violet colors but not red. However, they can see ultraviolet light which is invisible to humans. Bees' eyes also are excellent at detecting movement. According to NOVA's Buzz about Bees web page, bees are able to detect movements separated by 1/300th of a second compared to humans who can see movements separated by 1/50th of a second. Unfortunately, compound eyes are not as good as picking up details. In fact, their eyes are only about 1/60th as good as ours at distinguishing between objects, particularly at great distances. Even though bees can see parts of the light spectrum that we cannot, they still need access to some form of light to rely on their eyes for sensory information. Instead, bees rely on their other senses to help them communicate and navigate within the dark hive. For example, bees have sensory neurons located on the backs of their necks that help them use the sun as a guide outside the hive but that also help give them gravity-related information once they return to the hive. 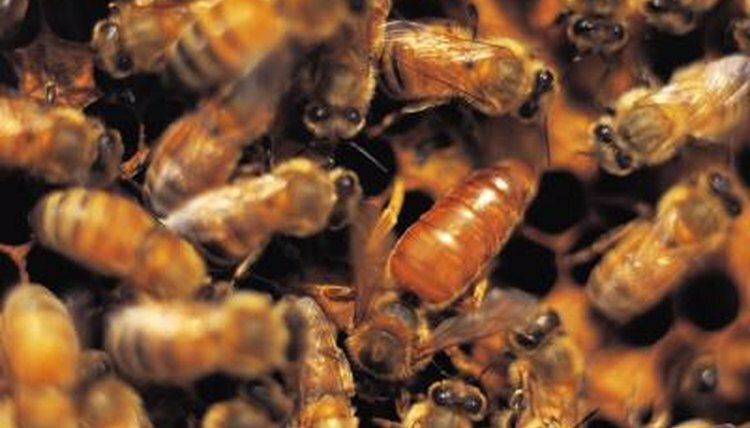 They also rely on pheromones, which are produced by the queen and transmitted throughout the hive by workers. These pheromones are specific to each hive and allow bees to both recognize their own hives and detect intruders. Within the hive, bees rely on their sense of touch. Bee antennae contain thousands of cells that pick up vibrations from around them. An important part of the antennae is the Johnston's organ. According to a study titled "Dynamic Range Compression in the Honey Bee Auditory System Toward Waggle Dance Sounds," published in 2007 through the Public Library of Science, the Johnston organ picks up the air vibrations caused by the waggle dance of the bees. Essentially, the bees are "hearing" the information provided by the bee dancer. How Do Butterflies Hear, Smell & Feel Objects?